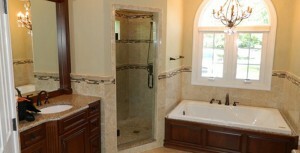 We specialize in the creation of custom bathrooms for our clients in the Charlotte, NC area. At Carolinas Custom Kitchen & Bath Center, we specialize in the creation of custom bathrooms for our clients in the Charlotte, North Carolina area. Because we understand the value that a custom bathroom can add to your home, we will talk to you about all of the options to make sure you choose something you will love on a long-term basis. If you have questions about the process of creating a custom bathroom, feel free to talk to your contractor or stop by our showroom.